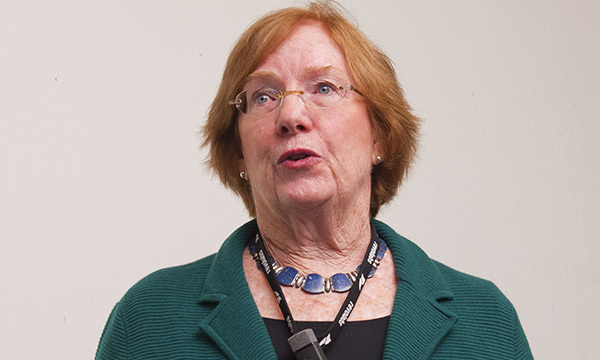 Speaking at the Chief Nursing Officer summit, nurse researcher Linda Aiken criticised lack of workforce planning and reliance on nurses from other worldwide countries. A world leading safe staffing expert has attacked poor workforce planning and an over reliance on overseas nurses in England. In a damning speech, nurse researcher Linda Aiken also criticised the introduction of nursing associates and an underinvestment in registered nurses. She told the Chief Nursing Officer for England's Summit: ‘I have to tell you, I am troubled by things I have heard here like “we'll always be dependent on nurses from the rest of the world to staff our health service”. Can you imagine the chaos that would be created in the world if the US said that? Dr Aiken was speaking at the conference in Liverpool on Thursday 8 March and referred to comments by the chief nursing officer Jane Cummings the day before, when she had praised the role of nurses from overseas in the NHS during her keynote speech. Dr Aiken said her research published in BMJ Open had shown a negative impact on patient satisfaction where there is a higher proportion of nurses in a hospital who have been educated in a different country. The director of the Centre for Health Outcomes and Policy Research at the University of Pennsylvania also warned that regardless of Brexit, recruiting from overseas was going to get much harder, with austerity policies being rejected elsewhere in Europe, but retained in England. She said the Republic of Ireland, for example, had provided England with many nurses but now wanted them back to for their own workforce. Dr Aiken also used her speech to criticise the introduction of nursing associates, commenting it was ‘funny’ how the enrolled nurse had come back despite being ‘deemed bad’. She said policy makers in England ‘profess not to be substituting registered nurses, but it doesn’t really matter because the introduction of nursing associates changes the composition of the skill mix at the bed side’. She explained: ‘You change the skill mix in two ways. You can add assistance from less qualified staff without adding more registered nurses – that de-skills the workforce, which has a negative effect. Or you can decrease the proportion of RNs through attrition, vacancies or simply hiring fewer. She said England ranked 10th out of 12 for poor skill mixes in comparison with peer European countries and said research consistently proved fewer registered nurses leads to increase mortality and poorer patient outcomes. England also ranked ten out of 12 for work environment according to nurse feedback, Dr Aiken said, and has one of the highest nurse burnout rates in Europe.